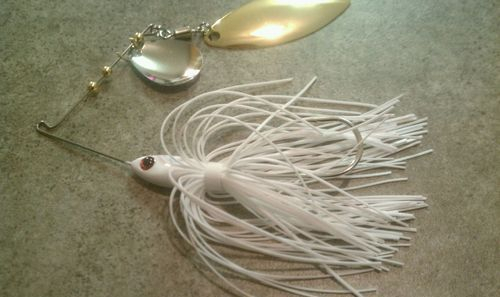 Cajun Tackle House brings you our NEW for 2012, The "Smiling Otis" silicone spinnerbait line. Featuring premium long-shank, Mustad Hooks and solid stainless steel .032 diameter wire construction. The Cajun Tackle House "Smiling Otis" Spinnerbait series is perfect for all water presentations. The tandem blade setup delivers maximum flash with ultimate vibration, while the silicone skirt provides additional fish attracting action. Additionally, the head of the Cajun Tackle House "Smiling Otis" Spinnerbait features a hand-painted, chip resistant coating with life-like detailing and features Red 3D eyes. Available in a variety of bass attracting colors, the Cajun Tackle House "Smiling Otis" silicone spinnerbait series has the premium features and performance serious anglers need on the water to catch more fish! As with many of our Cajun Tackle House products, if you need the Smiling Otis in additional sizes or with different blade colors & combinations, please feel free to contact us and we can have it built to your specifications. 1/4oz or 3/8oz Chart/Blue/White Smiling Otis............... $5.00 ea. 1/4oz or 3/8oz Pearl White Smiling Otis.................................. $5.00 ea. 1/4oz or 3/8oz Chart/White Smiling Otis................................ $5.00 ea. 1/4oz or 3/8oz Fire Tiger Smiling Otis....................................... $5.00 ea.